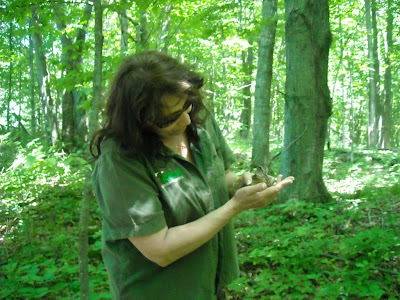 ( Photos: This is our former "baby" American Woodcock, now grown just moments before its release to the wild. There is nothing that makes a day brighter than when we have the chance to release some of our patients back to the wild where they were meant to be. Updating their category as "former patients" is a task we are happy to do. Katie drove to get this little one after a cat grabbed it near Tomahawk. Woodcocks have such fascinating life histories we were absorbed by the little one from the first day. 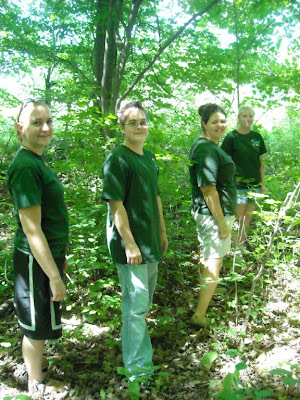 From my perspective, admitting unusual species when the interns are with us,gives them additional research to do and adds to their preparedness for a life working with wildlife. 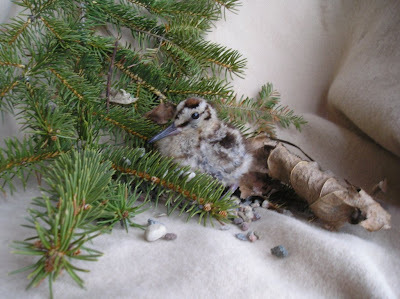 I wrote about the adult Woodcock being with this youngster in past blogs entries. 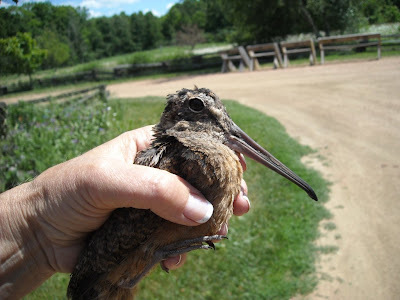 Unfortunately we were not able to release the adult with the youngster, but he was 100% ready to be a wild bird and was happy to show us upon release. While we were trying to get photos in the deep forest, he took off flying fast in an effort to put as much space between us and him as possible. Selecting perfect release habitat is very important to the success of the birds. If released in poor habitat with poor food availability or with strong weather looming can spell disaster for the former patient. Interns learn the importance of the entire process at REGI. ( Photos: Mallard ducks now, grown and flying were released by Natasha, Lance and Alberta on the Red River. 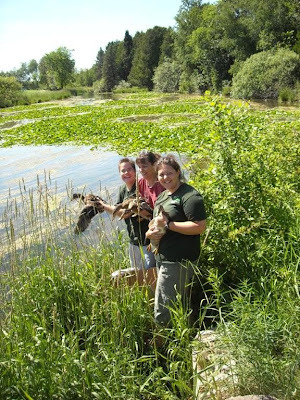 When four Mallard Duck ducklings were admitted on May 2 ( see blog for that day) our hearts went out to them. They were pulled from a sewer by a Wausau Police Officer having fallen there following their mother to water on the day of their hatch. They grew fast and did perfectly during the past seven weeks. It was time for them to be on their own. 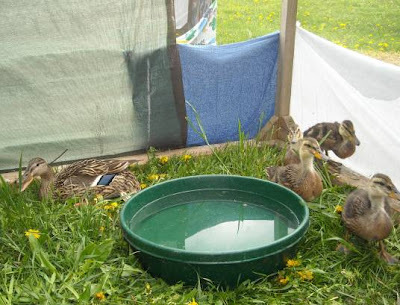 They were raised by a female Mallard Duck patient for several weeks and were definitely not happy with being caught up for their final physicals. Chubby and feather perfect they were put into a box for the trip to the Red River and perfect habitat for them to continue to thrive. 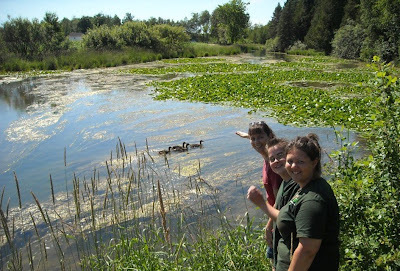 They went out into the water and quickly began eating all the things they grew to love back at REGI and some of the things we were never able to provide for them. It was wonderful to watch them play and eat with such self confidence. 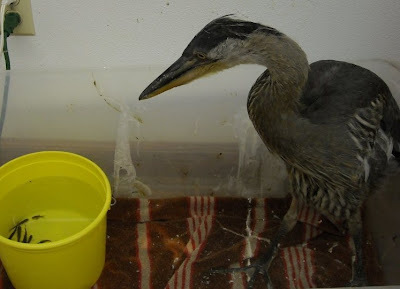 A quick update on our Great Blue Heron chick. He is hardly a baby anymore and is now aware of fish for the first time. The photo is of his first hunting pose the other day when he discovered fish in a pail. Have a great day everyone. We go into surgery with the Bald Eagle in the morning so be thinking of us.